For the holiday season, San Francisco gets lit. Christmas trees and holiday decorations feature gorgeous lights that spread cheer on those long winter nights. City landmarks and favorite tourist destinations like Union Square and Ghirardelli Square dress Christmas trees and light up the squares, as do major hotels and malls. Each neighborhood features avid decorators who create twinkling holiday scenes at their homes. Check out some of the most photogenic displays of holiday lights while taking in the most famous sights of San Francisco. 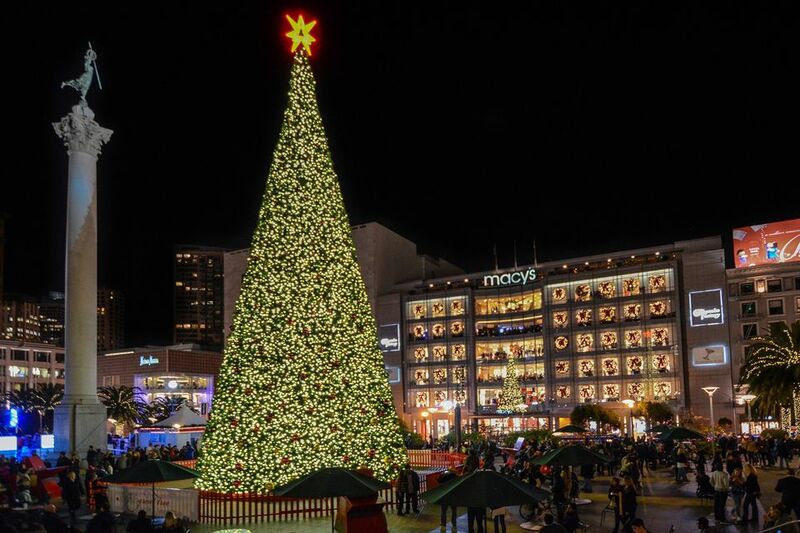 Macy's gift to the City of San Francisco is the 83-foot, reusable tree that is decorated with more than 43,000 twinkling energy-efficient LED lights and 700 shining ornaments. The ice rink in Union Square adjacent to the giant tree offers fun-seekers of all ages a magical adventure surrounded by festive lights and the sights and sounds of the season. Stroll over to Stockton and O'Farrell streets to gush at the cutest holiday window display in town: Cuddly, adoptable kittens and puppies from the SPCA, in Macy's windows until January 1. More than 17,000 lights trace the Embarcadero Center's towers. Take a spin on the Bay Area’s largest outdoor holiday ice rink through January 7, 2018, while taking in the scenery. At Five Embarcadero Center, step into the Hyatt Regency San Francisco. Crane your neck upwards to look at the Christmas tree and the streams of 300,000 lights cascading down the 17-story lobby atrium. Hang out by the main lobby front desk where you can revel in the "snow" coming several times per day up through December 31. The tree at Civic Center Plaza is elegant in its simplicity, adorned with white lights. City Hall itself is aglow in red and green for the holidays. The upscale Cow Hollow shopping district becomes a Fantasy of Lights, with lights on its Victorians and trees and parking meters fashioned into candy canes. The San Francisco Firefighter's Toy Program has barrels in some shops to collect toys for disadvantaged children. For a week in December, your children can participate in The Great Union Street Holiday Elf Hunt, where participating merchants will be hiding a toy elf in their stores for people to find. If found, participants can write that store’s elf name on a card and be entered to win prizes donated by Union Street merchants. White bulbs adorn the trees that line Huntington Park at California and Taylor streets. While you're on Nob Hill, step into the two-story-tall gingerbread house at The Fairmont San Francisco, made of gingerbread-smelling bricks, royal icing, candy canes, Christmas tree Peeps and other sweets. Some visitors try sample parts of the edible house, but it is not recommended. The impressive, edible abode stands more than 25 feet high with a railroad track that delights people of all ages. The hotel’s 23-foot tall Christmas tree in the main lobby is impressive in its own right. A winter tree-lighting tradition in Golden Gate Park began in 1929, when then-park superintendent John McLaren had the trees lit along Fell Street to try to cheer up San Franciscans burdened by the Great Depression. The rain-or-shine tradition continues with the lighting of the long-standing Monterey cypress at McLaren Lodge, 501 Stanyan St. (and Fell). Each year, on the day of the lighting of the tree, the park hosts a winter carnival with many free activities including a snow play area, carnival rides, a cookie factory, arts and crafts for kids, and live entertainment. Santa arrives shortly before the official tree lighting ceremony usually at 6 p.m. Since the 1980s, Tom Taylor and Jerome Goldstein have overstuffed the modest front yard of their Noe Valley Victorian home with Christmas decorations and a fully lit and decked-out live 65-foot pine tree. This fantastic tableau includes giant stuffed animals, presents, Tom and Jerry's stockings, a model Ferris wheel, trains, and other contraptions with moving parts. Santa gives out candy canes every night through Christmas Eve. The lights stay on through January 1. Since 1938, residents of the 3200 block of Thompson Avenue in Alameda have transformed their street into a heartwarming display of holiday cheer. Not only the houses, but also the center median is adorned with lights, cut-outs, and figurines. Santa is on hand nightly from December 9 through December 23 from 6:30 p.m. to 8 p.m. for photo ops (weather permitting). Throughout the month, the lane is frequented by local choral groups who bring the dulcet sounds of the season.